The Mud Blog: New Film by The Collective! "Seasons"
New Film by The Collective! 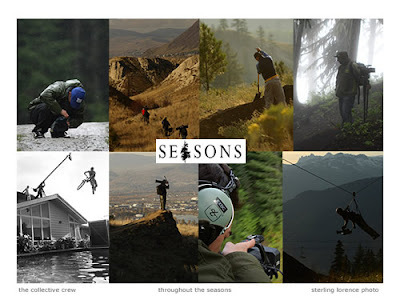 "Seasons"
We've all been looking forward to the new film by The Collective: Seasons. This is the follow up flick to The Collective and Roam. Its currently playing this month in theaters in cool towns across America! The DVD will be in bike shops in May. 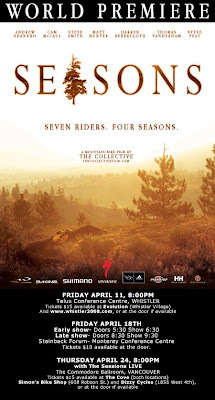 "Seasons is a film that follows seven of the world’s top mountain bikers through the course of four seasons of one year. The film explores what it means to be a full time rider as told through the lives of downhill racers, slopestyle competitors, and big mountain freeriders." The seven riders featured in the film are: Darren Berrecloth, Matt Hunter, Cam McCaul, Steve Peat, Andrew Shandro, Steve Smith, and Thomas Vanderham.